A stunning 18ct white gold ring with a sparkling diamond cluster totalling 3/4ct for eye catching sparkle. Perfect for an engagement, make sure your magical moment is as special as it can be with this beautiful ring. 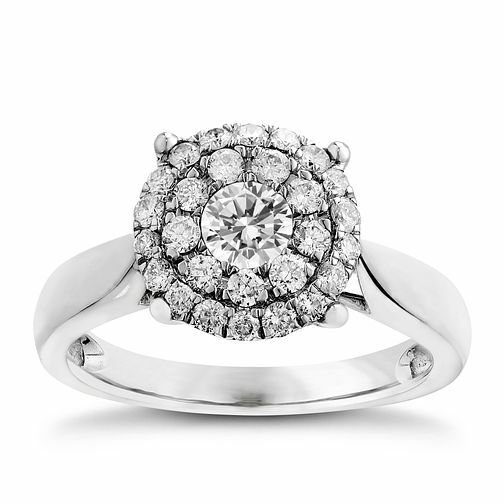 18ct white gold 3/4ct diamond cluster ring is rated 5.0 out of 5 by 1. Rated 5 out of 5 by Anonymous from ABSOLUTELY STUNNING - the perfect engagement ring Nothing like on the picture, I am absolutely in love with this ring, i’ve had so many compliments from so many people! I’m honestly and truly in love. It sparkles in the light like nothing I’ve ever seen before, and looks like it is worth so much more than it is!! Quality of the gold is great - not a really thin band! I can’t believe my partner chose this for me it’s incredible - really nothing like the picture it isn’t doing it justice!!! Please go in to store and look at this ring...I’m just in love...a perfect ring for a perfect engagement!